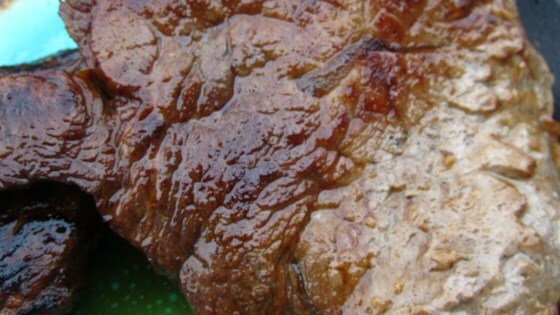 "Granddaddy's favorite steak marinade. Can be used with all cuts of beef. I usually reserve 1/2 cup of the marinade, then simmer it down to a syrup, and use it as a sauce for the steaks." To make the marinade, whisk together the red wine, soy sauce, lemon juice, Worcestershire sauce, mustard, honey, garlic, cumin, coriander, onion powder, pepper, and canola oil in a bowl until smooth. To use the marinade, pour over 4 steaks in a resealable plastic bag. Squeeze out the air, and massage the bag to coat the meat with the marinade. Refrigerate at least 8 hours before cooking to desired degree of doneness. Build rich flavors in sauces and reductions by simply adding a splash of wine! Very tasty - Used in slow cooker with Lamb and cabernet sauvignon. Substituted sage for coriander and added Fig vinegar. Can't wait to try this with other meats-Thank you! Oh Yeah!! This is a keeper!! Great marinade for fillets. No complaints here about anything!